The plate on which I portioned my half of the starter now resembles a Jackson Pollock painting; a drunken blend of vivid mint yogurt and a crimson chilli sauce that has the background funk of molasses and tamarind. The platter, once sizzling, is now a luke warm graveyard of bones. We have left nothing. Nada. Zero. Zilch. The waitress, a young and affable lady in her early twenties, asks how it was, to which I respond with a simple and concise ‘excellent’. She is pleased, like she had cooked it herself, and goes on to tell us how the new menu for the refit centred around creating this mixed grill to be as good as it can be. She goes into details about the different marinades they trialled for the three types of tikka, and how the lamb chops cooking time was constantly tweaked. It is a level of attention that I was not expecting, yet alone to hear of in such detail from the staff. Frankly, I am impressed. Welcome to The Horseshoe version 2.0. It is still The Horseshoe, I just added to the version 2.0 bit on the end to make it sound like a Hollywood movie. They’ve sharpened up the lines of the old interior. They’ve tweaked the menu to give it a more Desi pub feel. And they still offer a European menu which is sent back as soon as it is offered on account of the kitchen team looking more Mumbai than Milan. I blame the local community for this who clearly cannot accept that a pub which used to do pub food badly can now exist in the same bricks and mortar under a different cuisine. Would you ever go into a Fish and Chip shop and ask for Nasi Goreng? Exactly. If you come here and complain about the state of your carbonara, you’re an idiot and you only have yourself to blame. That mixed grill starts and pretty much finishes us off. It’s gargantuan in size and only a starter to the optimistic or American amongst us. Three types of chicken tikka; one a conventional marinade, another sharp with the acidity of pickle, and one fiery with green chilli. Two types of mince kebab; one lamb, the other chicken. Both with personality, the latter packed with the hot stuff. Lamb chops that have the funk of a James Brown record only without the domestic violence. Chicken drumsticks. I think I’m done. No, sorry, I forgot the quarter of tandoori chicken, all communist in colour and scorched on the fringes. 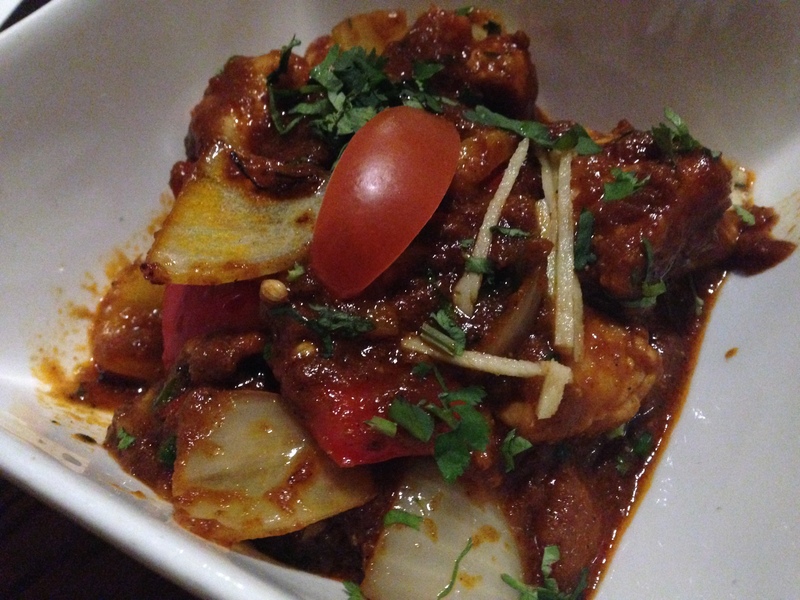 It’s all good; some, such as the chicken tikka, minced chicken kebab and tandoori chicken, are knock out brilliant. It is, right now as a collection, the best mixed grill in Birmingham. And I say that with the confidence of a man who has eaten many of recent in those considered as the premium. We take a couple of curries and a dhal, because we are greedy and promiscuous with our choices. The tarka dhal gets ordered again, as does the methi chicken whose fenugreek flavour slowly reveals like a burlesque dancer. The punchy achari gosht is a little more one dimensional – we get heat and tomato and not much else with the tender cubes of lamb. From a bread basket is a good naan and roti, with a stellar paratha that’s all buttery wafer. What we don’t finish they are happy to box up, and the following day we load the last of the lamb curry onto the leftover roti, with some yogurt which they correctly guess we would need. And there in a leftover box is all you need to know about The Horseshoe – they have their finger on the pulse and a firm eye on giving the customer what they want. And if you go looking for a mixed grill you really can’t do much better in Birmingham. Just go hungry. The previous incarnation of The Horseshoe was a local for my family. Probably twice a week my brother and I would go with my parents there for a 2-4-1 meal that would do little for the development of my taste buds. Dad would his work way through a huge portion of mixed grill, whilst Mom would order the same and pick at the chips for forty minutes before sneaking all of the meat into a tissue for our pet dog at home. My brother and I, now into our late teens, made the most of the fact that Dad was picking up the bill. For it was these afternoons that we developed a taste for beer in epic proportions that still haunts me now. I never cared much the gammon steaks full of sinew, the chicken devoid of any moisture, or the curries whipped straight out of the microwave. The curries at The Horseshoe have thankfully moved on from those days. Since they change ownerships they have featured in the British Curry Awards finals for the last three years, thanks to their Chilli & Spice menu, which was a good enough reason for me to go. I do love a curry. Inside the large pub things had changed from how I remembered. The bar was still there, though the stains had been polished out and lacquered to a mirrored shine. The bar area has soft furnishings and the look of somewhere I could easily enjoy a pint of Cobra after work. The restaurant, segregated by glass, is all wood, leather, and white walls. 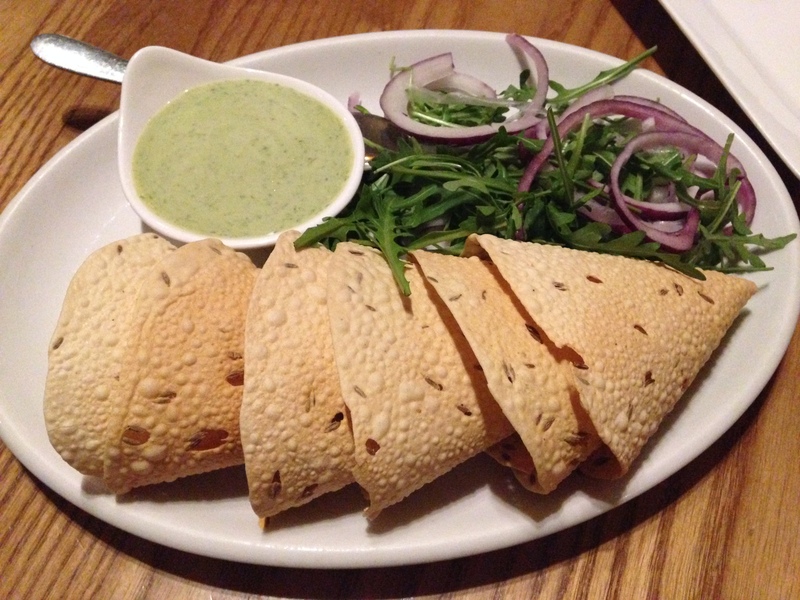 We sit down and quickly order poppadoms, which are not the freshest I had, though are still a cut above your local balti house. 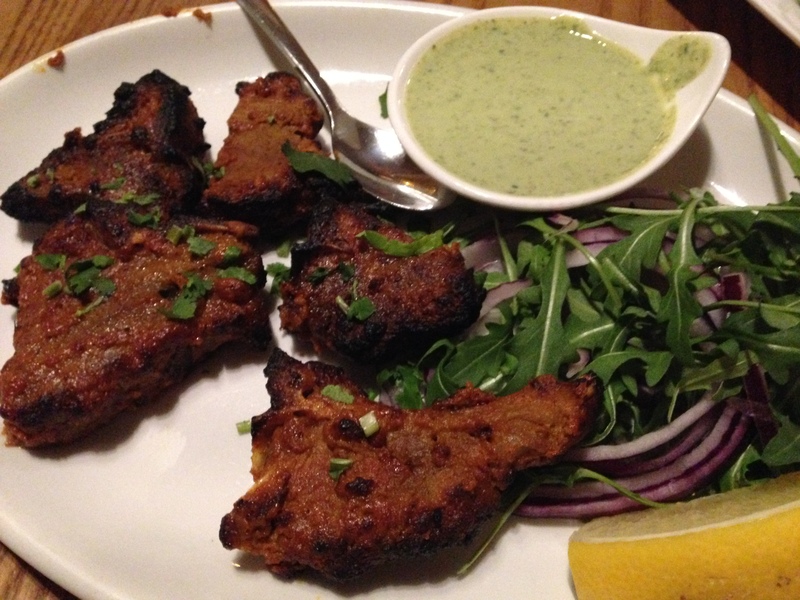 Starters suggest a serious operation: Lamb chops have a dark char and crust from the time spent inside a seriously hot tandoor. Inside the meat is pink with the flavour of the animal matched with a spicing that elevates it way above the norm. They are delicious to point that I consider ordering more. 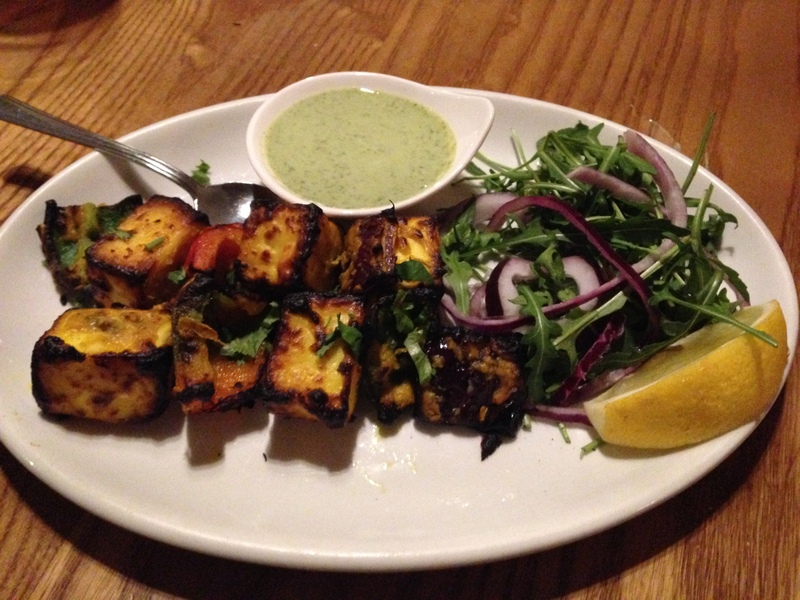 Paneer tikka had cubes of the size of children’s building blocks, also given the tandoor treatment. The spicing again was spot on, with each of the blend distinct and traceable against the blandness of the paneer, which is similar to cottage cheese. Baked chunks of pepper and onion provided the textural difference that was needed. After all this I was expecting the curries to be some kind of revelation, an expectation that would fall well short. 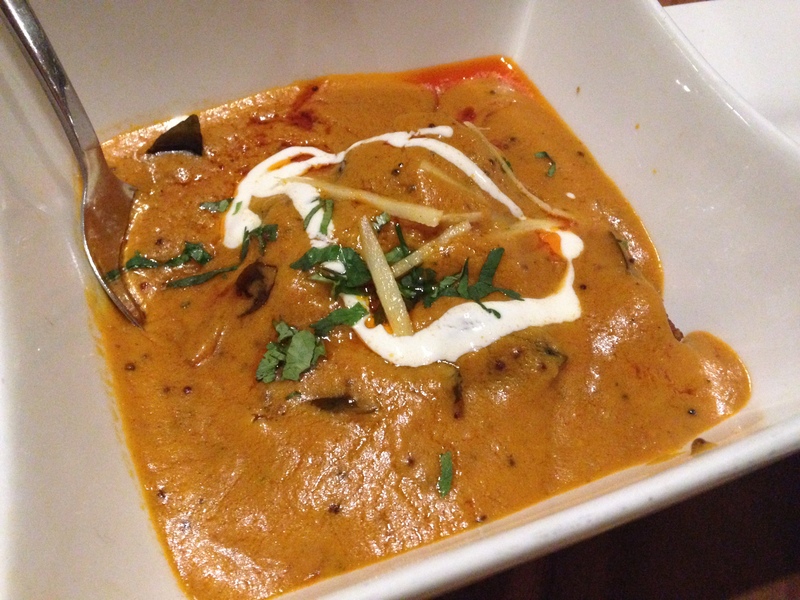 A fish curry leant heavily on coconut – a combination I am familiar with from my travels in Goa. The sauce was muted to allow the fish to be present, which would have been fine had the fillet not been overcooked to a mush. We nearly sent it back. In hindsight, perhaps we should have. A feisty Kadhai with good quality chicken was more successful, the chilli flavour bullish though mitred by clumpy chunks of onion. Rice with flecks of crispy onions and spiced with cumin were a revelation, less so were the parantha which bordered on greasy.